Sometimes when I am showing proofs I'm almost sorry I'm not a man, so I could go into the darkroom, shut the door and say words you wouldn't print. Honestly I think this proof proposition is the worst part of the whole business. The man under the light can work his head off to get something fine and artistic, and then it's my new hat against a package of chewing gum that the sitter selects the most commonplace proof in the lot to print up from. Argue the case? You can't argue with a woman - why even I come back with "because" when I can't think of anything else. "Why, my dear Mrs. Smith, see what a soft delicate lighting that one has, and what a graceful position." "Yes, but my diamond brooch shows so much better in this one." Oh! Wouldn't I just like to land my lily white hands in her twenty-five dollars worth of puffs for just one good pull, but, instead, I have to practice deep breathing for a minute, and then say, "Why, yes, that is so," and then try and get back by landing her order for twice as much as she had figured on. And it isn't all the women either, some of the men are just as bad; lots of'em imagine that we can not only grow hair on bald heads and straighten cross eyes, but also put some elixir of youth into the developer and turn them out Apollos and Adonis' - and then when they gaze on the unretouched proofs and see just how unkind nature has been to them, and all the licks old Father Time has made at them, they just grouch - the conceited, horrid old things. The work of Pirie Mac-Donald is known because he dares to make his pictures tell the truth. He puts the character of his subject, as he reads it, into the picture. And MacDon-ald, himself a man among men, can read men. His critics, and like every man who has made a place for himself he has critics, have sometimes claimed that his work is brutally frank. Maybe so - but at least nobody ever said it was "wishy-washy." The "photographer of men" evidently believes that real MEN like the truth - prefer the honest likeness. He makes truthful pictures because he knows how, because those are the pictures that he enjoys making. He has succeeded because pictures of the vigorous stamp please the virile, energetic men who make up his clientele. Pirie MacDonald is his own operator; every detail of his business from meeting the prospect to a personal inspection of the finished Artura print, is at his finger tips. His personality enters into every part of his business. He is that business. Under such conditions a large output, in the factory sense, is not possible. But the finished product being a part of his personality, a large income is possible. And the discerning class is willing to pay for that personality. We consider it fortunate, both for our readers and ourselves, that we are able to illustrate this number with the forceful work of Pirie MacDonald, Photog-Rapher-Of-Men. Retouching has at last taken its proper place in the making of portraits and has become an art in place of an elaborate display of manual skill. Time was when good retouching consisted of filling every available face space of the negative with retouching lead. True this lead was placed with great care, and to be able to create what was known as retouching texture a great amount of practice and skill was necessary. The finished result was a nicely rounded out face, and this result was considered right, even though it did not truly represent the features of the sitter. To-day through evolution this is changed and a portrait by photography is a portrait of the sitter - a portrait truly representative of that sitter and appreciated as such by all who see it. True there are a few who wish to be flattered, but they are not as a rule the most desirable patrons, and the majority of sitters want what they came for - a pleasing likeness but not a false one. 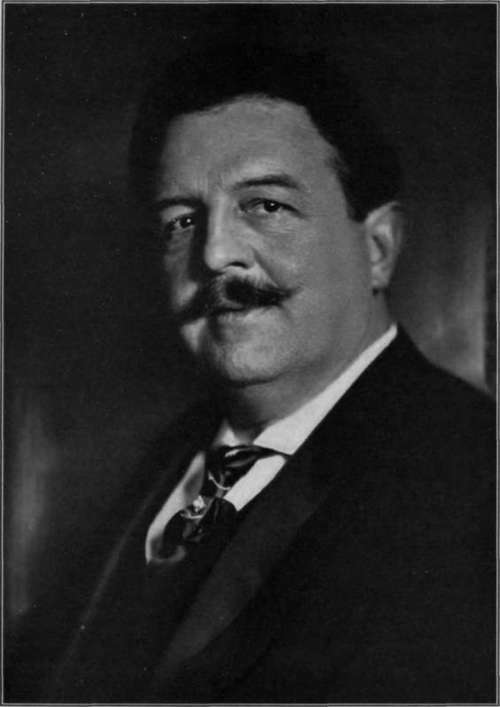 Victor Herbert, Conductor and Composer. This change is due to a better appreciation of portraiture by the photographer and increased skill in posing and lighting. The photographer of to-day makes his portraits pleasing by placing each subject in a lighting best suited to bring out the best points in the features of the sitter and in a pose equally well selected. This intelligent use of light and selection of pose does not destroy the likeness of the sitter and leaves little to be added by retouching. The good retoucher of to-day applies lead sparingly and doesn't attempt to change the modeling of the face to any extent, as this has been properly attended to in the making of the negative. Retouching to-day where the better grades of work are produced has changed from the excessive use of lead to the use of a minimum amount and good retouchers agree that the secret of retouching lies in knowing where to put the lead and when to stop rather than in fine texture and plenty of it.